(Real Simple) -- Time can be on your side -- if you re-shape your schedule. With the help of a dozen psychologists, researchers, and coaches, we came up with a three-part plan to reseize the day. 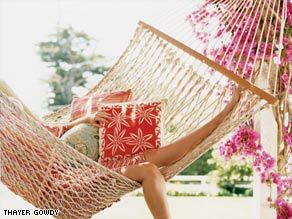 Valorie Burton, a life coach in Annapolis, Maryland, says to write things like hammock time on your to-do list. Figure out why you want more free time. "You can't win a game you haven't defined," says David Allen, a productivity expert and the author of the best seller "Getting Things Done." You'll be more motivated to change if you have a specific goal. Make a wish list. Write down all the activities that you long to do more of -- whether they're things that make you happy, relaxed, sane(r), or all three. For example: going for a swim, sleeping until you're no longer tired, volunteering on a project you care about, or getting an hour all to yourself. Now write down how you really spend your time. If it's all one makelunchcarpoolrunlikeachickenwithitsheadcutoff blur, keep a detailed diary for a few days. "You might be surprised by how little time you spend doing things you love most," says Randy Pausch, a professor at Carnegie Mellon University and a father of three young children who transformed a diagnosis of fatal pancreatic cancer into a crusade to urge others to live every moment. "The Last Lecture," a book he coauthored, is a New York Times best seller. Says Pausch, "The key question to keep asking is, 'Are you spending your time on the right things?' Because time is all you have." Real Simple: What's your body trying to tell you? This is the hard -- but liberating -- part: Rethinking the way you spend your time. As you sit in front of your crammed-full daily diary, consider that devoting more time to what you love can help you get more done overall. "It sounds like a paradox," says Neil Fiore, Ph.D., a psychologist and an executive coach in Berkeley, California, and the author of "The Now Habit." "But research shows that to be productive and creative, you must make time for recreation and relaxation. Trying to skimp on them hurts your motivation and often leads you to procrastinate." Plus, being a little selfish will keep you from becoming resentful, burned out, or cranky. And that's a good thing for everyone. What can I delegate? OK, so maybe your 11-year-old can't load the dishwasher as well as you can. Hand over that task and you've got 10 minutes to spend on something more fulfilling. The fact that you're teaching your child responsibility -- with, yes, an occasional eye roll or chipped dish -- is a bonus. Try similar strategies at work: Give junior staffers assignments that stretch their capabilities, rather than swooping in and doing the job yourself. What can I outsource? Housecleaning and lawn care are obvious answers, but also think about things like tutoring for your kids -- especially when it comes to subjects that take hours to get up to speed on (amo, amas, amat...). Before you decide you can't afford this, scrutinize your spending. Chances are, there's a way to reallocate your resources. Could you forgo dinner out one night a week in exchange for freedom from all that washing and folding? If you need more convincing, calculate what your time is worth, says Timothy Ferriss, a time-management expert and the author of "The 4-Hour Workweek." To get your "hourly rate," cut the last three zeros off your annual salary, then halve that number. So if you make $60,000 a year, your hourly rate is $30. "If it takes you three hours to clean the house each week, that's $90 worth of your time," he says. What can I do less well (at least sometimes)? Here's an easy efficiency boost: When something you're working on is good enough, stop. "It's a waste of time to do everything perfectly, such as polishing the underside of the banister," says professor Randy Pausch. "Instead, focus on doing the important things adequately." Like showing up at a friend's birthday party even if you haven't found that just-right present. Or making a simple pasta dish for a special dinner instead of going full-out gourmet. Not only will you gain more time but you'll also have energy to actually enjoy these events rather than just feeling frazzled. What distractions can I limit, if not eliminate? • Shut the door. Seriously. If you have work to do, make it clear to your assistant/colleagues/kids/spouse that you need to be left alone. A 2004 study found that office workers are interrupted, on average, every three minutes. • At work, resist the urge to check your e-mail 500 times a day (or however often you usually do). For a truly rewarding challenge, time-management expert Timothy Ferriss recommends checking only twice a day -- at noon and at 4 p.m.
• At home, give that BlackBerry a rest. "BlackBerries hijack your downtime," says Edward Hallowell, a psychiatrist in Sudbury, Massachusetts, and the author of "CrazyBusy." In addition, the devices give the illusion of efficiency. "People erroneously believe they can type on their BlackBerries while watching the news or talking to their families," says Hallowell. "But if the tasks are at all demanding, you are creating the perfect storm of mistakes, misunderstandings, and mismanagement." • As for TV, watch a show you love, then turn off the set. The average American spends 2.4 hours a day in front of the tube, but that investment yields sparse rewards. "We found that watching TV doesn't make people nearly as happy as activities that really engage them, like playing tennis, taking a walk, and sharing a meal with their family," says David Schkade, a psychologist and a professor of management at the University of California, San Diego, who recently coauthored a study on the subject. Translation: You'll get more psychological benefits from choosing other forms of fun. Now that you've freed up precious minutes (hopefully lots of them! ), it's time to reshape your days. "Overwhelmed? Take the helm," says productivity expert David Allen. In other words, decide how you want to spend your energy. Establish one or two "nonnegotiables" and work your schedule around them. For example, eight hours of sleep a night, two hours of exercise a week, or one night out a week for fun, suggests Valorie Burton, a life coach in Annapolis, Maryland, and the author of "How Did I Get So Busy?" "You have control here," she says. "You just have to take it." Write down only what you can realistically accomplish in a day -- three to five items is a doable amount. Then consult your wish list and make sure at least one item from the top of the list is part of your weekly plan. Yes, that means writing in "30 minutes on the hammock with my novel." Schedule a quick and brainless task first. This will allow you to cross something off your list right away and to start the day feeling accomplished. Schedule your most onerous task second. Whether it's a difficult conversation with a friend or a tedious e-mail to a colleague, plan to get it over with next. "If you have to eat a frog," Professor Randy Pausch cracks, "it's best not to look at it too long before you do." Challenge the list. After you've finished writing it, try to cross something off. "Sometimes all it takes to keep your sanity is to drop just one thing," says Burton. To figure out what that one thing is, go back to the questions in step two (such as "What can I delegate?"). If you're still having trouble, ask yourself: "What item here least reflects what matters most to me?" Have a reality check every Friday to reassess. Gina Trapani, editor of Lifehacker.com, a Web site dedicated to time-saving technology tips, is a huge fan of this approach. • Do just a dash of whatever it is you're avoiding. "Force yourself to work on the task for a short period of time -- perhaps as little as one minute," says Merlin Mann, creator of 43folders.com, a time-management blog. "When you realize how much of the anxiety was created in your head, you'll give yourself the jolt needed to follow it through." • Post a procrastination-busting Post-it. Time-management expert Timothy Ferriss suggests writing on it: "Are you inventing things to do to avoid what's important?" Then stick it wherever you'll see it regularly, like on your computer. • Break projects into pieces. The optimal amount of time to spend on a task is 40 to 90 minutes. After that, take a break to recharge, says psychologist Neil Fiore. And keep in mind that work expands to fill the time available for its completion. When you give yourself incremental deadlines, you're more likely to get things done quickly. • Take rest seriously. This eight-hour goal is no joke. Not only will you feel better but you'll also be more efficient. "When people are scattered, they perceive that they don't have enough time," life coach Valorie Burton says. "Sleep deprivation only makes the problem worse." So which comes first, the time or the happiness? Impossible to say. But the odds are good that the more time you make for yourself, the happier you'll be.